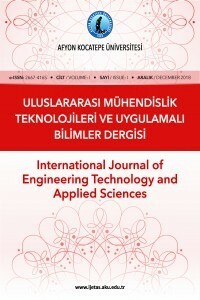 Afyon Kocatepe University, which started to be published in 2018 in accordance with the aims of Afyon Kocatepe University to be a leading university in scientific studies and sharing, aims to be an important tool for the transformation of the results of research and development activities conducted in our country and abroad in scientific publications in our university. .
Afyon Kocatepe University Journal of Engineering Technologies and Applied Sciences is a peer-reviewed journal published in the field of basic and applied sciences. The journal, which publishes Turkish and English articles, is published every 6 months and two volumes are completed. Our journal publishes Additional Issue and / or Special Issue when it deems necessary. All kinds of responsibility of the works to be published in the journal belongs to the authors or authors. AKU-IJETAS does not charge any publication fees at any stage. It is open for free from http://dergipark.gov.tr/akuumubd. Each loaded article is primarily screened through the iThenticate plagiarism screening program. Articles with a score of over 20% are not accepted. Articles are evaluated by at least two referees by blind arbitration.